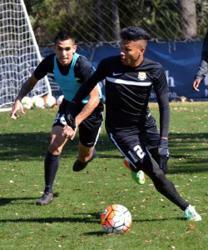 Midfielder Maikel Chang swerves upfield in his first appearance for the Old squad during an Old-v-Young scrimmage on Feb. 26. 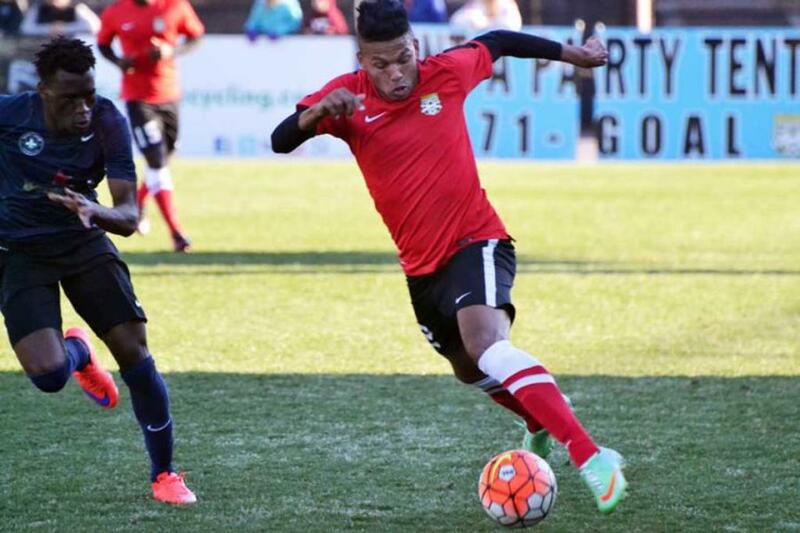 Of the three Cuban players who signed with the Battery in 2013, Maikel Chang has been the late bloomer. Forward Heviel Cordoves scored seven goals in his first season. Odisnel Cooper earned the starting goalkeeper job as a rookie and won Team MVP in in 2015. Chang? He offered glimpses of amazing skill, but essentially missed his rookie season with injuries, He emerged as the team’s top assist man in his third season, and appears poised for another leap forward in 2016. He’s also the Spanish-speaking Battery player who is least likely to respond to questions in English, a trait that gives fans and teammates who lack Spanish fluency a mistaken impression of the 24-year-old’s personality. Last weekend against the New York Cosmos, Chang went the full 90, assisted Ricky Garbanzo for two goals, and delivered the deflected pass that fell to Dante Marini for the final score in Charleston’s 3-0 win. With the season opener for his fourth year in Charleston coming up on Saturday, Chang is flashing mid-season form and big-league talent. And if you think that just because he doesn’t speak much English, he doesn’t understand what you’re saying, you’re making a big mistake. If there was ever a good time to get to know this gifted young player, this might be the moment. We caught up with him after training on Monday, and sat down with Garbanzo acting as our interpreter. Chang plays egg toss at the 2015 Regiment Player Appreciation Picnic. Talk about growing up in Havana and your childhood. I grew up in La Habana del Este (East Havana), near the beach. There’s a lot of activity around the beach, but my neighborhood was more quiet. I could do whatever I wanted in my neighborhood, and if I wanted to go to the beach, it was right there. In East Havana we had all the sports, and there was Estadio Panamericano, so I saw everything. But then soccer became my thing. What profession would you have had if you hadn’t been a soccer player? I didn’t really have anything else in mind. I’ve always wanted to be a professional soccer player. I had some option to maybe go to baseball, but I chose soccer. In Cuba, all the sports are in the schools, and that’s where we all started playing. For me, the easiest sport to play was soccer, because it was right there at the school. I didn’t have to go somewhere else. All I had to do was show up, and there were all the players there. The coach saw that I was doing well, and I just stuck. Baseball has always been the No 1 sport in Cuba, but the way soccer has been growing all these years, it’s looking like it may be No. 1 pretty soon. Chang developed a new-found tenacity in 2015. Can a man earn a living playing soccer in Cuba? Enough to pay the bills? Well, in Cuba there’s no rent, but no. if you want to play, you won’t get anything. You just do it because you love the game. If you get on the National Team, they’ll pay you a little bit, but it doesn’t mean you could support a family with that. 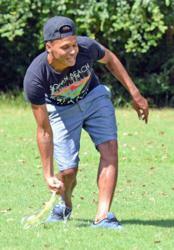 It’s just for the love of soccer. When I came to the United States for the first time, I was for a tournament in Tennessee (the U23 Olympic Qualifying Tournament in Nashville in 2012). And Heviel was saying, “Hey, we should stay. Being professional here is so much better than Cuba.” So once that next time came, I made that decision. Because I wanted to play professionally, and to get paid, and to have a good life. I want to continue doing that. Everything. Everything. Here you can find everything easily. Like, if you want a steak, you can go to the grocery store. If you want a newspaper, you can get a newspaper anywhere. In Cuba, you have to search for a newspaper. If you want good meat, you have to search for it. You have to ask. It’s completely different. Here is big. There are cities where there are big buildings and a lot of things. There in Cuba, it’s kinda small, not as much going on, not as many businesses. Have you made a lot of friends here? The four years I’ve been here, I’ve made so many good friends. They’re pretty much like family. I have more friends here now than I had in Cuba. If I had to leave, it would be difficult for me. Are you happier here than you were there? I am happy here, but my family is over there. I am happy playing professionally. President Obama is in Havana today, and Cuban-American relations are warming up. The travel ban was lifted last year. When will you travel back to Cuba to visit your family? In about five years. Since I left the National Team (in Canada in October 2012), Cuba gave us a penalty that said we could not return for eight years. That’s Cuban law. But since Obama is over there, and with everything that is changing, it could be less. Yeah, but this was his eighth year. So he could go back. Do you think you’ll ever play for the Cuban National Team again? It’s kinda difficult, because you pretty much abandoned your team, and the people don’t look at that favorably. Because who wants to see a guy leave and come back? But there are so many Cubans here that you could make a Cuban national team right here in the United States. I want to be champions of the USL. I want that for the team. I want it for myself. That’s my No. 1 goal. I also want to be the leading assist man in the league. Otherwise, I just want to get better every day and keep progressing and helping the team. How’s your English coming along? I get the sense that you understand a lot of what’s being said. I understand a lot. Like you two talking, I understand that. But when it comes to speaking, I’m a little cautious. Some time back I asked one of your Spanish-speaking teammates who was the funniest guy on the team, and it surprised me when he said it was you. I thought at the time, “But he’s so quiet and shy.” Since then I’ve seen you with your friends, and I realized that I’ve never really known your true personality, because my Spanish is so weak. It’s all the language barrier. If I was more confident with speaking English, I’d be that same guy, I’d be joking round. It’s just feeling nervous. Sometimes I’m not sure what to say, and I don’t want to say something wrong. TOP IMAGE: Maikel Chang makes a move against Saint Louis FC during a 1-1 preseason draw last month. 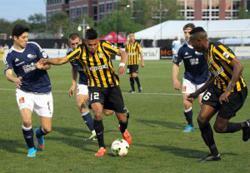 Dan Conover/Charleston Battery photo.